172 x 120 mm. – 38 leaves, with 36 decorated pages, including 1 full-page coat of arms and 31 miniatures. 172 x 120 mm, 38 leaves, 36 decorated pages. Not a large book, but with a miniature on almost each page, this is a fascinating witness of Flemish culture of the early 16th century. 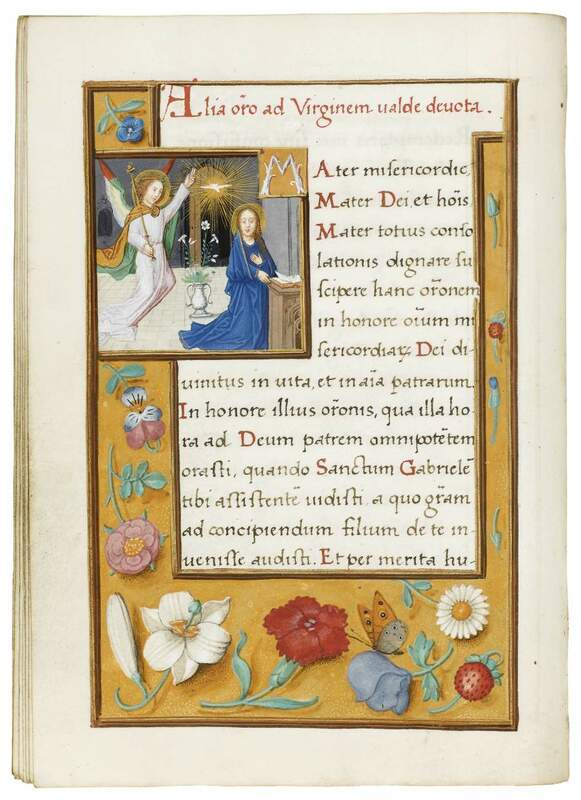 Perhaps the earliest surviving prayer book presented to or commissioned for the young Charles V, it is also one of the first manuscripts featuring elements of the Northern Renaissance. The exceptional iconography is linked to Bruges traditions – where Charles received his Joyous Entry in April 1515. Made c. 1516 for the young prince Charles V (1500-1558), with his arms at the front of the book, all texts in this manuscript are brief prayers, practical and easy to read, as if destined for a young person. The borders on the sides show illusionistic schemes painted in what is known as the famous Ghent-Bruges style. The miniatures convey dramatic effects in gestures and subtle lighting, while the overall tone is geared to quiet contemplation. The interesting pictorial program, foremost those of Christ’s body pouring forth sacramental bread and wine from his wounds, that of him in a wine press, and the Holy Sacrament appearing to travellers in a boat, is rare. This pre-eminence of the images of the Corpus Christi and Holy Blood is fascinating. Very few handwritten prayer books made for Charles V are preserved. This is perhaps the earliest manuscript of all.